The easiest and most delicious bread you can make- pour, stir, then bake! Vegan and kosher as well as soy, dairy, oil, and nut free! Available in Rosemary and Garlic, both perfect for dipping in either our Tuscan Herb Olive Oil or any of our varietal EVOO's mixed with our Classic Italian Spice Blend. Roasted Garlic and Cheese Soberdough: The same warm roasted garlic and herb blend with a cheesy twist. The best choice for a sidekick for any meal. Suggested Brews: Standard Domestic Beers, Pale Ales, American Lagers, Club soda. Apple Fritter Soberdough: A sweet bread including apple chunks and a cinnamon swirl makes this the perfect bread for any breakfast or as a dessert with ice cream. Suggested Brews: Hard Cider, Apple Ales, Brown Ales, American Lagers, or Sweet Stouts. 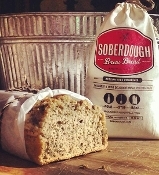 Sea Salt and Cracked Pepper Soberdough: A savory delight, this bread makes a great side with its subtle salt and pepper incased in the richness that is Soberdough. Suggested Brews: Standard Domestic, Pale Ales, Brown Ales, and American Lagers.